to be viewed on the large screen T.V. Every 2nd and 4th Wednesday at 11:30 a.m.
Tuesday Community Reading of the Weekly Bible Lesson…. Sixth Church Reading Room extends an open invitation to the community to join with others each Tuesday at 12:30 to read the weekly Bible Lesson. Click here to learn more about the reading room. Stop in to the Reading Room for fresh inspiration! You are invited. Learn more about Christian Science by attending any of the following lectures given by members of the Christian Science Board of Lectureship. find-us/find-a-lecture to view a more complete list of lecture events. 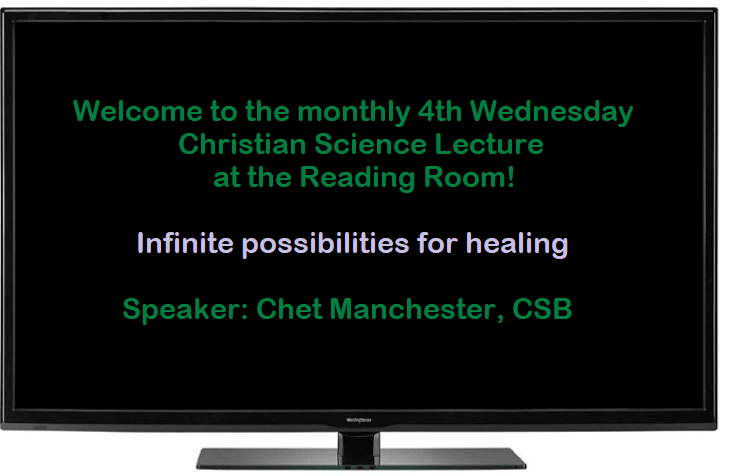 To watch online lectures, go to christianscience.com/christian-healing-today/lectures-online.